Bloodborne and Airborne Pathogens, Seventh Edition was developed for use as a manual within infection control courses offered through the Emergency Care & Safety Institute. This text is designed to meet the current Occupational Safety and Health Administration (OSHA) training requirements and to teach students and employees how to prepare for potential occupational exposure to blood or other potentially infectious materials. 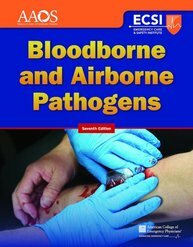 Bloodborne and Airborne Pathogens, Seventh Edition also covers specific bloodborne and airborne pathogens, such as HIV, the hepatitis B virus, tuberculosis, and other unusual infectious diseases. The Instructor’s ToolKit includes PowerPoint presentations, detailed lesson plans, course outlines, and evaluation forms. Bloodborne and Airborne Pathogens videos that provide detailed skills demonstrations that enhance the classroom learning experience for students and assist them through their own practical examinations.